DISCOVERY This evening, a private Apsara Dance Performance brings ancient Khmer culture to life through music, song, and dance. Participation in this vacation requires purchase of the following flights from Avalon Waterways, not included in pricing: (1) roundtrip air from your U.S. gateway and intra-vacation air segments; or (2) intra-vacation air segments only, starting at $530. 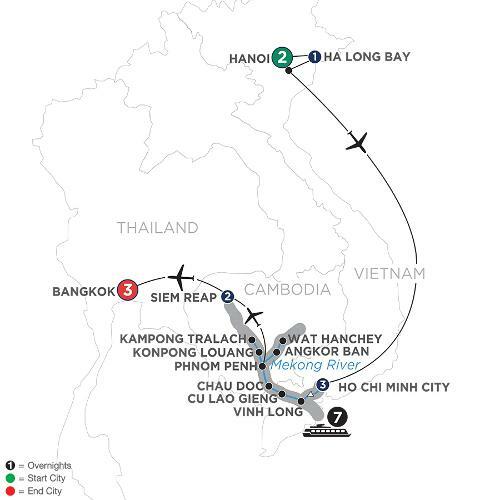 Required intra-vacation air segment: Hanoi/Ho Chi Minh City; Phnom Penh/Siem Reap; Siem Reap/Bangkok. Air prices were effective on February 6, 2019 and their availability is limited. At the time you purchase your tour, air prices may be higher.